Bought 100 of these for use in our small groups, really has been good to open up discussion about the impact and implications of the gospel in real life situations. Highly recommended. A broad range of resources to support many areas of growth of christian life. Very useful suggestions in email letters and helpful catalogue. Customer service quickly responds to queries and orders in a way which many much larger retailers fail to achieve. I have no concern in recommending the Good Book Company. I'm a church planter and this blog is published to help my core group and missional community grow in their understanding and living of the Christian life on mission through missional training. 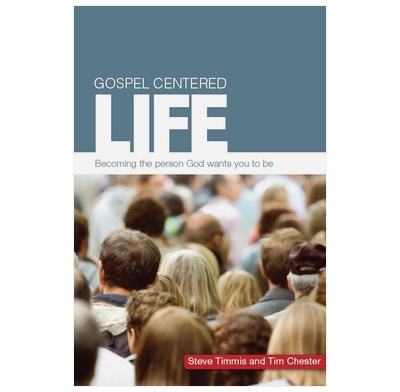 One of the resources that I'm using is Steve Timmis & Tim Chester's The Gospel-Centred Life: becoming the person God wants you to be. This material was created to help "Ordinary Christians live the truly extraordinary life that God calls us to." It continually teaches and demonstrates, through scriptures and stories, how the Gospel message changes everything. It will help reshape your identity, how you spend your time and money, how you prioritize your life, how you deal with heartache and how you witness to others in everyday non-threatening ways. This booklet could be used as a small group study. Yet we are using it more for a weekly devotion for each of our leaders. Our Core group meets every Tuesday. I ask them to read each chapter on their own every Wednesday and come back to it once or twice a week. I want my core group to not only read the content but to live it and incorporate it into their lives. Then at the next meeting we discuss the content and how we've put it into action or how it's changed us. This material has been a helpful tool to slowly shift our perspectives and priorities. Its helped us to understand the Gospel more and to understand how to live with greater Gospel intentionality. There are a number of good features of this book. First it makes the reader think, and doesn't provide answers in the back. Secondly it covers three major dimensions of Christian living and illustrates in practical ways what Christian living looks like. As such it is an excellent resource for people who have recently been converted as well as a timely reminder to those who for years have been in complacent ruts. Thirdly its teaching is related to the Bible. Having said that it is rather daunting to plunge into the Corinthians' question about food offered to idols at the start to get at the verses about living to the glory of God. We get no help with key ideas such as 'crucifying the flesh'. We are sometimes asked questions about the case studies with which each chapter begins when we lack contextual information about the characters e.g. p.37. I'm using this material with our High School students for Bible study, and it is wonderful. The students love it, and we are all being challenged both in our theology and in our practical lifestyles as Christians. Highly recommend this resource for anyone looking for a quality, deep, challenging bible study. I found this book a very good read with plenty of food for thought, it is very well written and you can feel yourself being spoken to in many vparts. I would recomend this book to any who might need a nudge in the right direction or who just wants a spiritual hand up. I have found reading this book has helped me with ways that I have been thinking for a while and wondering where to turn to. It has also given me a lot of scope to work on in bible study, it makkes you think and then helps you to find an answer maybe not in full agreement with what is written but your own answer. Highly recomended. In conclusion, it's a great resource to get your hands on and one that I heartily recommend to anyone whose heart's desire is to bring glory to God by living a gospel-centred life!